Where can I find EMF Compare ? How can I use EMF Compare programmatically ? Can EMF Compare be used standalone ? Can I programmatically open a comparison editor or dialog ? Can I use custom identifiers for my objects ? Can I ignore differences on a specific reference, or ignore ordering differences ? These FAQs will be aimed at EMF Compare 2 and subsequent versions. Since this version largely differs from the previous 1. * stream, answers related to version 1 cannot apply in most case. A : EMF Compare will be triggered for any files being recognized as an EMF model. 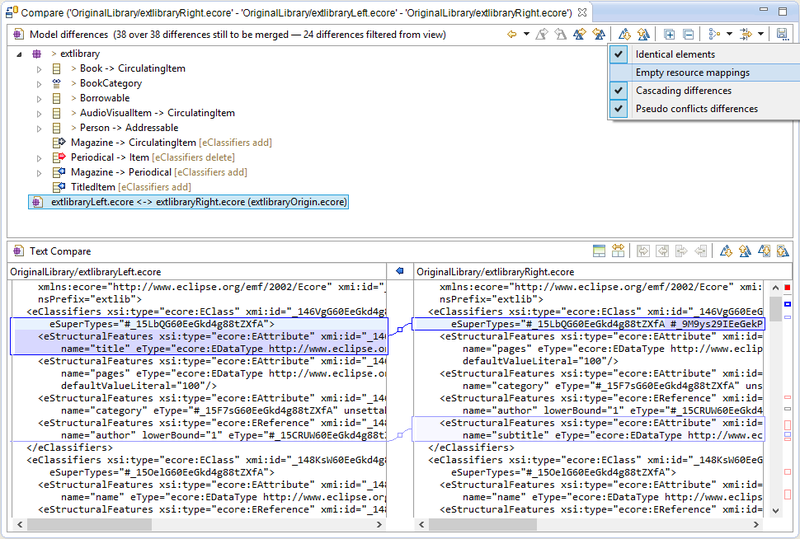 Technically, it will be files recognized with the content types XMI (org.eclipse.emf.ecore.xmi) or "EMF Compare" (org.eclipse.emf.compare.content.type). If your models are compared with the text compare editor and you want EMF Compare to be used instead, you should add your own extension using the Preferences view / General / Content-types and add your file extension in the "EMF Compare" content-type. A: Every files locked with XMI content type (i.e. 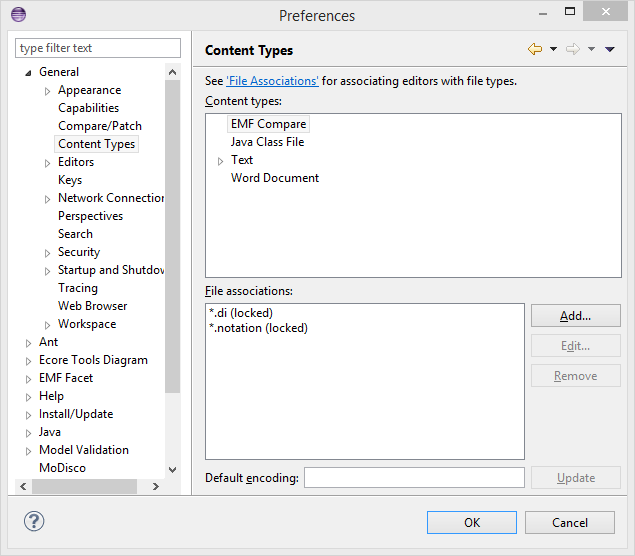 their content type is "org.eclipse.emf.ecore.xmi" or one of its subtype) or EMF Compare content type can not be forced to use the text compare editor. This is a Eclipse Compare platform limitation. You can, however, see the text comparison from the EMF Compare editor. Deactivate the "Empty Resource Mappings" filter and then select the appropriate resource mapping. The bottom panes will display the comparison of the textual content of the mapped resources.